A road car. A race car. An engineer’s car. The 911, more than any other car, is a product of continual automotive evolution. Porsche’s enhancements have kept it relevant for the road, competitive on the track and have cemented its reputation as the enthusiast’s car of choice. That evolution isn’t just limited to Porsche itself; an entire industry out there takes 911s backwards and forwards in time, improving, re-imagining, personalising. The 911 is an eminently adaptable basis upon which owners can build the car they want from it. With this 964, that’s exactly what RPM Technik has done for its owner Ian Humphris. The idea was for a fast road car that could be track driven, adding contemporary performance while being respectful to the classic feel and engagement a 964 brings. Using a Carrera 2 as its basis, the build process has been meticulous, seeking improvements in every area, this now a 964 that can run with its more recent GT department relations, yet offers a driving bandwidth that enables it to be enjoyed on the road, too. Of all the many branches of 911 evolution and sub-species, this visceral, exciting 964 arguably represents the most appealing opportunity for perfecting and personalising, taking a tired Carrera and reviving it as a car that can be enjoyed. 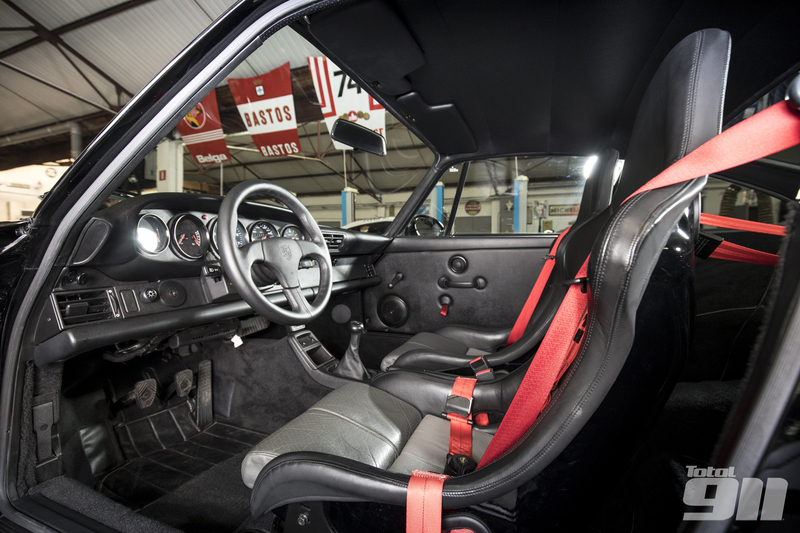 Its performance absolutely eclipses a 964 RS that you’d be too scared to drive. What RPM and Humphris have created is the perfect riposte to a zeitgeist where vehicular value takes president over the value of driving itself. It’s a sunny day at Bedford Autodrome, our track time exclusively reserved for RPM Technik’s 964 3.8. Owner Humphris likes his cars too: there’s a 997 GT3 RS in his garage, alongside some other special machinery, but it’s the 964 he’s animated about. It’s obviously not standard, but to the uninformed could just be a neat, small, red Porsche 911. Its lowered stance could be missed, its split-rim BBS alloys less so. Humphris admits that they’re his road wheels, having a set of Cup 17-inch wheels with some cut slicks for serious track work. There are subtle hints to its revisions visually then, the black-rimmed headlight surrounds an RSR nod, the small lip splitter a neat addition under the front bumper. There’s no surprises seeing the brake intakes on the front bumper, though they’re framed by darker indicator lenses. These, like those headlight surrounds, contrast perfectly with the red bodywork. Around the back the build follows the same understated enhancement route, this 964 retaining a single exhaust pipe, though the engine cover suggests that single pipe is attached to something a little bit different from the norm. The sticker, not badge, says 3.8 R, a model that’s entirely of its owner’s making, and justifiably so. Specification or naming purists be damned, this is a car that defines purity, a car built for an individual, with their – and only their – ambition and goals for it driving the entire project. If, like us, you’ve a keen eye on 911 values and auction results in particular, RM Sotheby’s recent Amelia Island sale would have made for a fascinating watch. While many Porsche struggled to build on their lower estimates, lot 167 reached well into seven figures before its frantic end, the sale transporting us back – momentarily, at least – to the explosive heyday of the Porsche auctions of 2014 to 2015. The car in question was a 964 RS that set a new record for the model by fetching an eye-watering $1.65million. This wasn’t any ordinary 964 RS though, but the rare, wide-bodied, 3.8-litre 964 RS. Achingly desirable having covered just 800km and looking stunning in Paint-To-Sample Ferrari yellow, the car is just one of 55 examples ever built by Porsche. But what do we really know about Porsche’s rarest road-going Rennsport? It’s worth a reminder of the car that sired this very special Neunelfer, and that model was the 3.6-litre 964 RS. Appearing in 1991, it was born from Porsche’s need to go racing in the Carrera Cup – a series that had been conceived by Roland Kussmaul and talented engineer, Helmut Flegl – and pared a mildly fettled flat six producing 260hp with an obsessive focus on weight saving. The result was a 911 that exhibited a purity of focus not really seen since the seminal 2.7RS. Naturally, Porsche felt the need to take things a step further, and it would again be motorsport that lay at the heart of their decision. More specifically, it was the desire to race an RSR variant in the bigger-engined GT-category, and the result was the car you see here. Constructed by the racing department at Weissach and only available by special order from them, there has tended to be some dispute around the actual numbers made, although our information tells us that just 104 examples of the 3.8 RS were built and, of those, just the aforementioned 55 were for road use. The remainder were RSR racers, and of the total production all except two were left-hand drive. But anyone thinking this was little more than a warmed-over 3.6 couldn’t have been more wrong, and by the same token if Porsche had set a budget for this project, then it seemed the engineers had ignored it. For one thing it differed markedly in appearance, being based on the wider Turbo body shell and featuring a more extreme aerodynamic package that encompassed a deeper front spoiler and a biplane rear wing that was both adjustable and formed in one piece with the engine lid. The shell was also strengthened over the 3.6 and contained additional welds, while aluminium was used for the doors and luggage compartment lid. Along with lighter glass, and a cabin stripped of all extraneous trim and equipment, Porsche quoted a kerb weight of 1,210kg, made all the more impressionable given the larger brakes, body and wheels. Whatever the actual numbers, it could still be considered extremely lithe compared to any other 964 variants (the 320hp Turbo was a positively porky 1,470kg), and then there’s that engine. The M64/04 unit gained its extra capacity via an increase in stroke from 100mm to 102mm – the bore remained at 76.4mm – although that was just the beginning. Developing 300hp at 6,500rpm and 360Nm of torque at 5,250rpm – both notably higher crank speeds than required by the 3.6 – the new motor featured a raft of careful developments, including an increase in compression ratio (up from 11.3:1 to 11.6:1), a revised intake with individual throttle butterflies to sharpen the throttle response and tweaks to the engine-management system. Bigger inlet and exhaust valves were fitted, too, with sizes increased to 51.5mm and 43.5mm respectively, and gas flow improved with polished ports. For the full, in-depth article on Porsche’s rarest Rennsport, order your copy for delivery direct to your door here, or download the digital issue to your Apple or Android device.